Golden Age Aquaman had a strong father, who died when Aquaman was old enough to handle it. 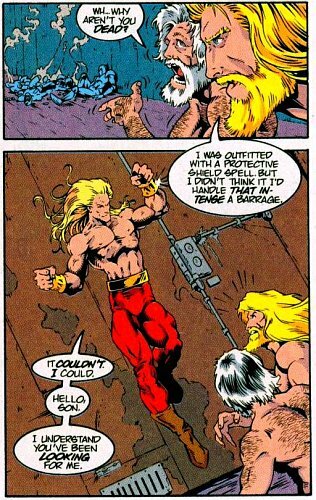 The Silver Age Aquaman also had a strong father, and again he died when Arthur was an adult. The Modern Age Aquaman has it hard. He lost his first father figure when the man, a lighthouse keeper named Arthur Curry, vanished under mysterious circumstances. He then learned that his real father was an ancient wizard of Atlantis, a man he didn't meet until this adventure, which happened in Aquaman #22 (1996).